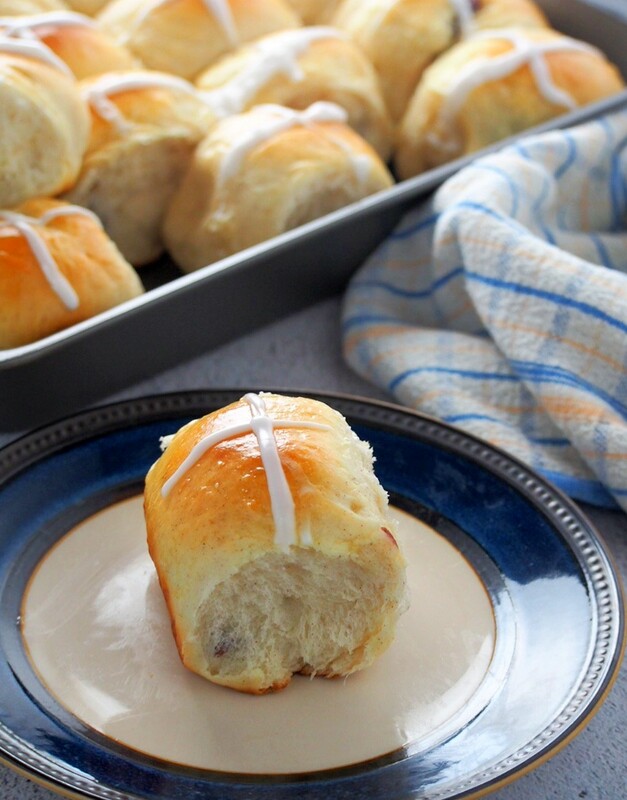 Whip up your own batch of Hot Cross Buns this year! 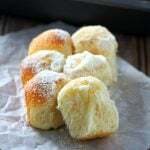 This homemade version is simple, tasty and soft. You will never need to buy them again. 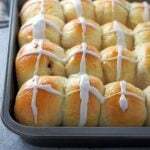 My first encounter with hot cross buns was in their gigantic form, being passed around at a work meeting one sunny day of April. More than the white crosses on them, it was the cinnamon-y scent that lasted with me as an impression. 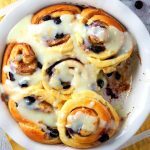 I did not care much for bread infused with any spice (aka cinnamon) before I started this blog but somewhere along my baking journey, I developed a deep fondness for cinnamon rolls, and for baking bread in general. The cinnamon spice became bearable, then soon, lovable. Who knew? It is pretty much the same as liking avocado toasts now and anything with coconut, when I used to dislike both. Life. You will be surprised at how you change. 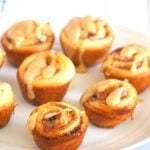 These buns are ever so lightly infused with cinnamon, and one more spice that I have grown to love, the cardamom. If cinnamon is warm and earthy, cardamom is bright, fruity, and fresh. 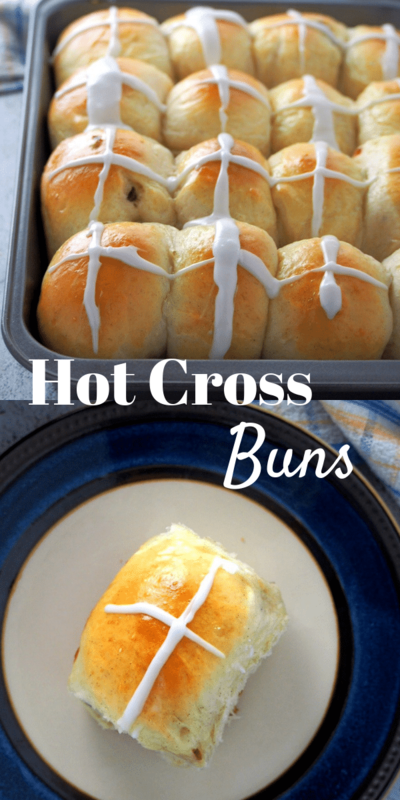 Together they give these hot cross buns a subtle flavor that is noticeable but not overpowering. In a large mixing bowl, combine yeast and warm milk. Let them stand until they form a creamy mixture. Add the butter, sugar, salt, spices and eggs. Stir everything well using a wooden spoon. Add 3 cups of flour, one cup at a time, stirring well after each addition. Add the remaining flour gradually, about 1/4 cup at a time, just until the dough gathers in the center of the bowl as you stir. You may not need the entire remaining flour at this point. Turn the dough over on a lightly floured board. 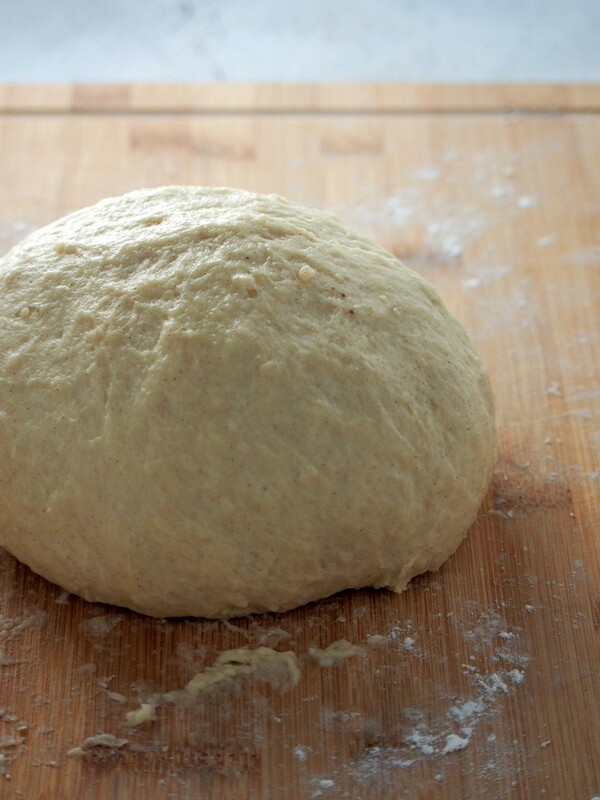 Knead the dough until it is smooth and elastic. Use some of the remaining flour to dust your hands and the board as necessary to prevent too much sticking. Shape the dough into a ball. Place it in a bowl and cover it with plastic wrap. 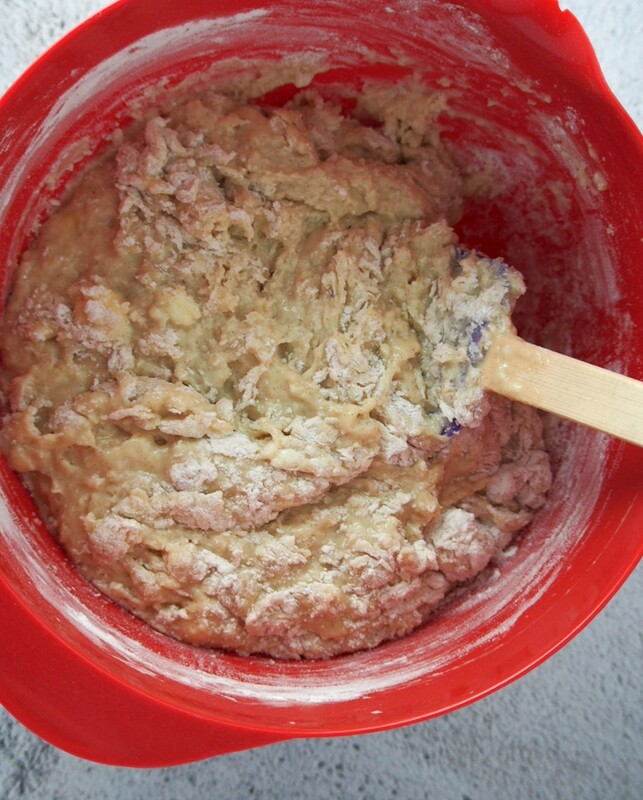 Let the dough rise for 1 and 1/2 to 2 hours, or until the dough is doubled in bulk. Meanwhile, soak the craisins in boiling water for ten minutes. Drain. After rising, gently deflate the dough. 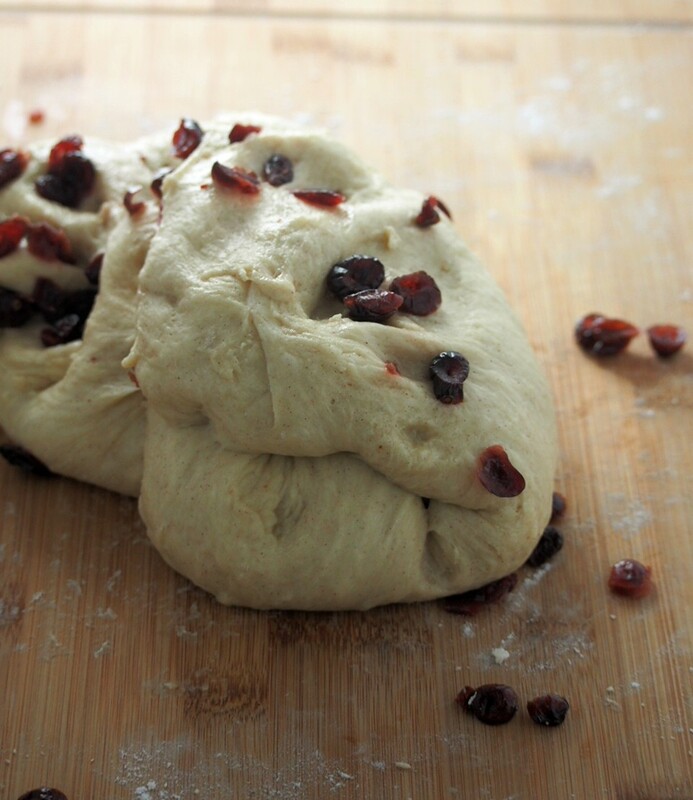 Knead in the craisins so that they are incorporated into the dough. 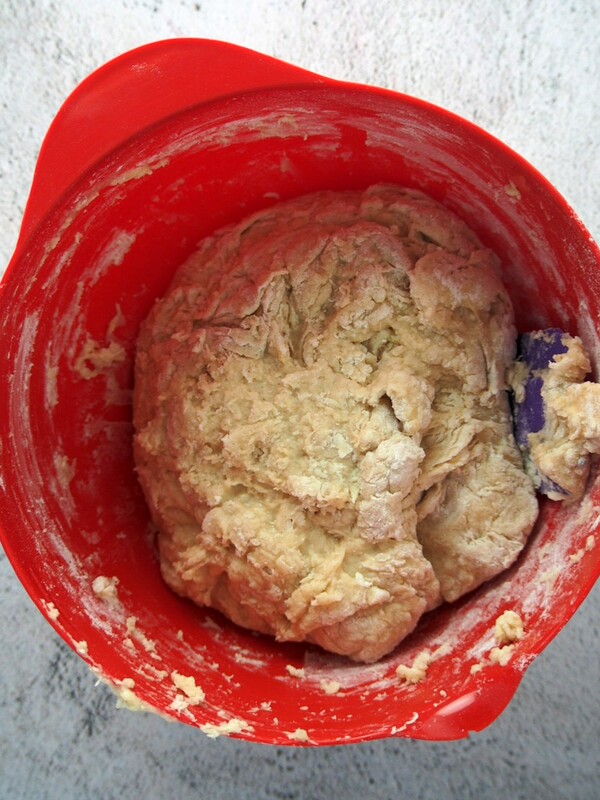 Divide the dough into 16 portions using a sharp knife. Shape each portion into a smooth ball. Arrange them on a greased 9×13 baking dish. Cover them loosely and let the buns rise for 1 hour, or until the size is doubled. Bake the buns at 350 F for 15-20 minutes, or until the tops are golden. Let the buns cool completely. 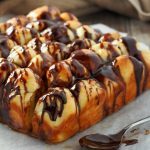 To form the crosses, pipe the glaze over the buns or spoon the glaze in long vertical lines over the buns in a column, then spoon the glaze horizontally across every row. I love these buns speckled with craisins. The glaze gives a sweet note and the slight infusion of spice is just perfect for a mild flavor. 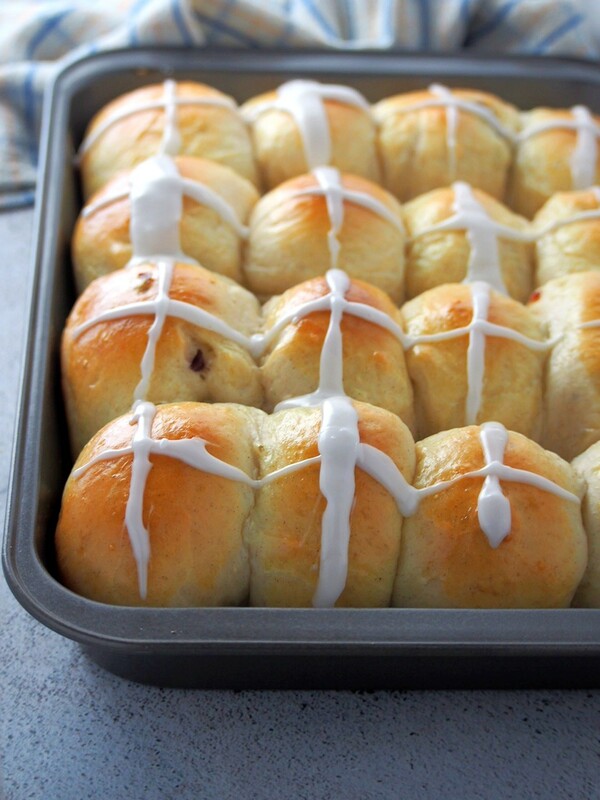 They are hot cross buns, exactly the way I want them. So make your own this year, nothing beats bread fresh from the oven. 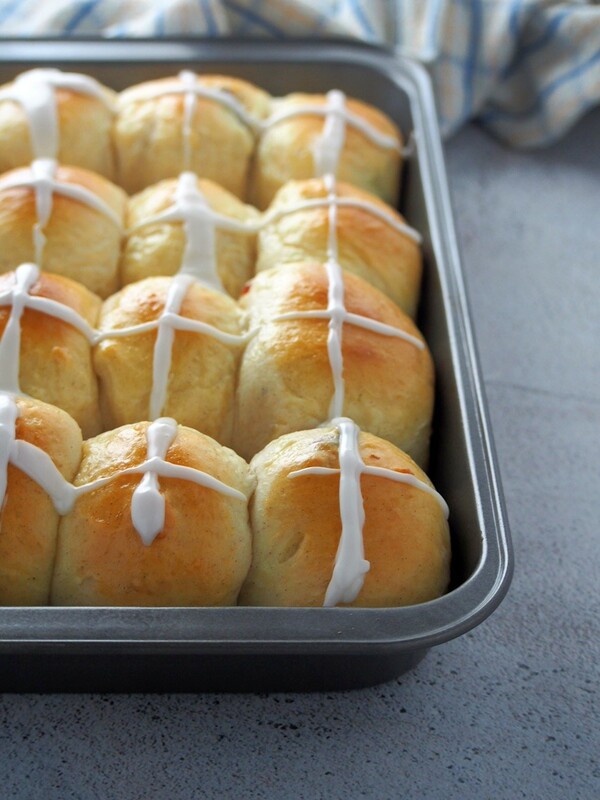 If you have not given hot cross buns a try, start with these. You will be surprised at how delightful they are. 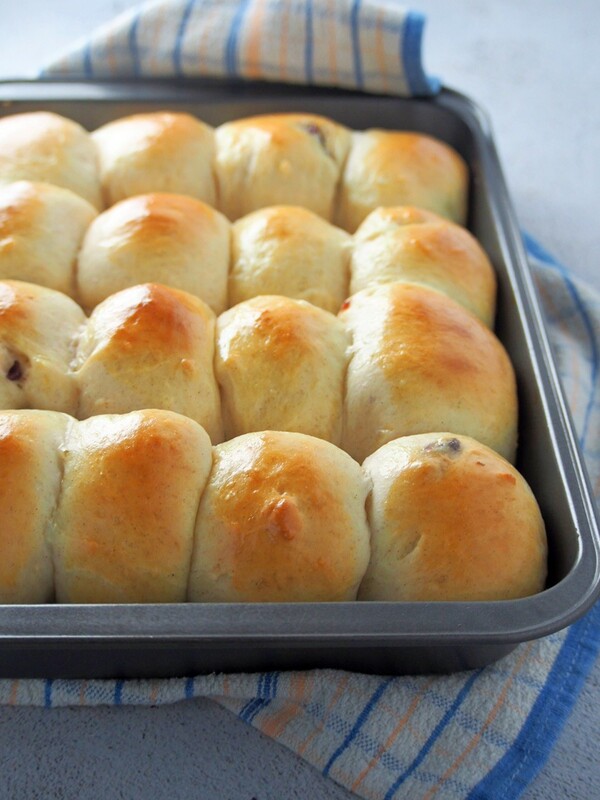 This homemade version of Hot Cross Buns is simple, tasty and soft. You will never need to buy them again. 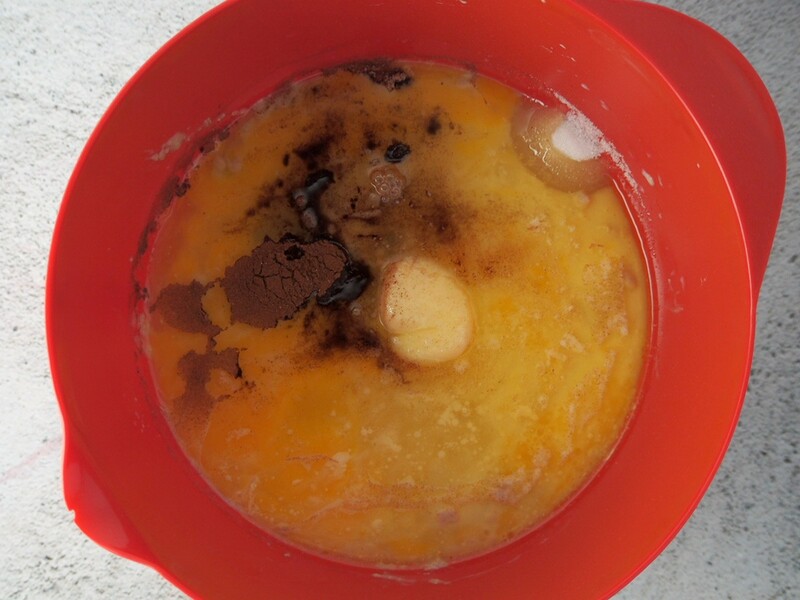 In a large mixing bowl, combine yeast and warm milk. Let the mixture stand for 5 minutes or so, until creamy. Add the sugar, softened butter, salt, spices, and eggs. Stir well with a wooden spoon. Add 3 cups of flour, one cup at a time, stirring well after each addition. Add some of the remaining flour, 1/4 cup at a time, stirring well just until the dough gathers in the center of the bowl. You may not need the entire amount of flour. Shape the dough into a ball. Place it inside a bowl and cover it with a clean kitchen towel. Let it rise for 1 and 1/2 hours. Meanwhile, soak the craisins in 1 cup of boiling water for 10 minutes. Drain. 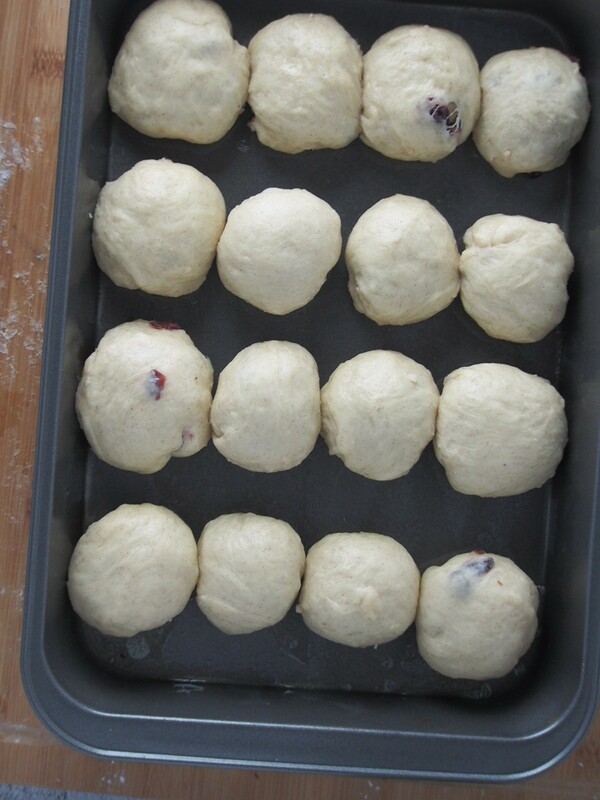 Gently deflate the risen dough and knead in the craisins. Using a sharp knife, divide it into 16 portions. Shape each portion into a smooth ball and place them on a greased 9x13 baking pan. Cover the pan loosely and let the buns rise for 1 hour, or until doubled in size. Preheat oven to 350 F. Bake the buns for 15-20 minutes or until the tops are golden. Let the buns cool in the pan. Combine the glaze ingredients. 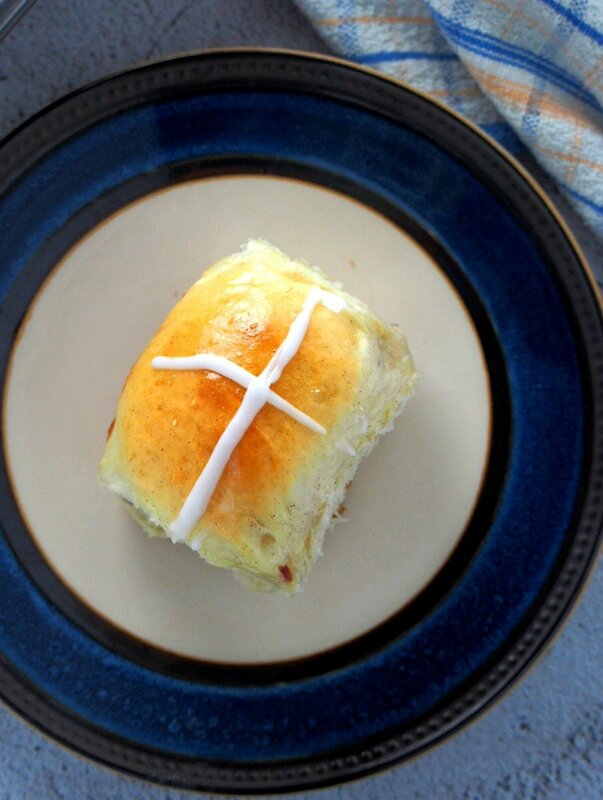 Pipe crosses in each bun or spoon the glaze over them to form the crosses. oopps! Sorry! Edited to add the craisins. It is 1/2 cup.